If you got any more games adapated, fixed or even written for the SuperCPU which are NOT here yet, e-mail me! A shoot'em up for the SuperCPU. These games have been fixed, adapted and/or fitted with extra stuff to support the SuperCPU. The 'patched' version of 3D Pool. 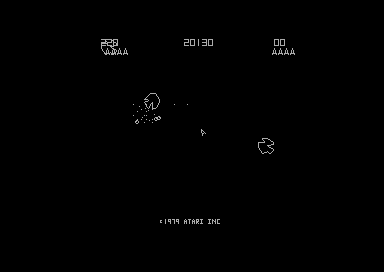 A very nice emulator of the Atari's classic arcade game "Asteroids" from 1979 running on the Commodore 64 with a SuperCPU. A very nice racing-game from bird's-eye view. 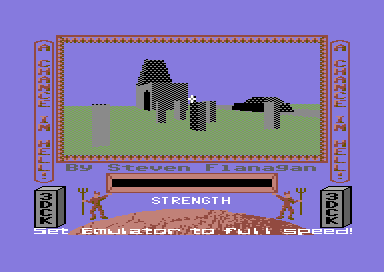 And finally there is a fully working version of it, even with Ramdisc-System and some more cool extras. This is a great Katakis-alike shoot'em up-game by Brainstorm-Software featuring 14 levels, amazing endmonsters and a huge extra-weapon-system. The game offers a one-player mode and 3 different two-player-modes. This is a (more or less) direct build of the original ID software source code release with a hacked together tiny clib for the string/mem/math/etc functions it required. 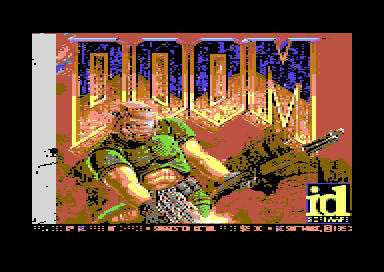 While this DOOM port isn't meant to be taken seriously, it has proven quite useful for testing and improving the MIPS recompiler as DOOM is a rather complex and large application. The final one in the Last Ninja series, and the best one! Will you be able to kill Kunitoki ? The culty German economy-simulation benefits a lot from DMAgic's SuperCPU Ramdisc-System. Specials: SuperCPU Ramdisc-System, codeprotection removed, crunched. Also known as "Behind Jaggi Lines". A culty vector game. The culty Vector-Space-Game. This is one of the masterpieces by Damon Slye and friends. The funny jump'n'run by Protovision. The little green muscle-eater stole your muscles! Find him and get them back! What is DMAgic's SuperCPU Ramdisk-System? The DMAgic SuperCPU Ramdisk-System incredibly reduces loading time of the program in which it is installed. If you got a SuperCPU with SuperRAM-card, its RAM will be used as a RAM-disk. All once loaded files will stay in it, and when they would normally have to get loaded again, they instead will be depacked from RAM (with 20 MHz)! In some cases you may also load all data files to the SuperRAM in advance, so while playing there won't be ANY loading-breaks! If you don't have a SuperCPU, the progs will ofcourse behave and load normally, which means that a SuperCPU is not required for the particular program, but recommended. Important info concerning the detection of SuperRAM: If you have a SuperCPU without SuperRAM and you have SuperCPU DOS 1.32, there will be a wrong value at the memory-location CMD uses to check if there's SuperRAM or not. Therefore, SuperRAM will be "found" although there is none. If you have SuperCPU DOS 1.40 or higher, there's the correct value and the detection works 100%. So, if you have a SuperCPU without SuperRAM and you have SuperCPU DOS 1.32 or lower, get yourself a newer SuperCPU DOS and/or a SuperRamCard ! The following games benefit from a SuperCPU and did not require adaption or fixing. This is a Freescape game created using the 3D Game Construction Kit. Game Story: The Devil has invaded your coastal village, and has kidnapped the village population. As the village priest, you alone must defeat the devil and rescue your flock. A main road goes through the village, but don't expect anyone to stop for you as they have heard the news. The 3D Construction Kit came with this 'demonstration' game.. This is the new eXtreme version, compiled with the 3D Construction Kit by Steven Flanagan (sjf.com@virgin.net). The game has been specifically modified to run at high speed, between 20x to 40x normal C64 speed is ideal, and gives a very smooth experience. This is a cool 3D-Game done with Freescape. Once again you have to save the princess. Good luck! A nice racing-game! Catch the gangstar and hit him! 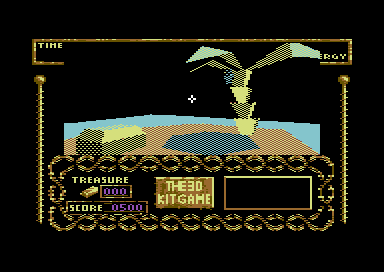 An action-adventure by Firebird in transparent 3D. Find your way out of the nuclear bunker full of mislead robots and set mankind free! Another Freescape 3D-Game. Find the Cyborg 2900 and destroy it ! Please notice that this game is completly in German! The follow-up of Driller. Some say it's even better. The legandary Driller. Pump off the gas from the planet! 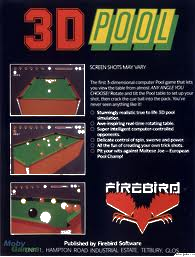 This is a cool 3D-game from 1984. Find the appearing objects with the help of your radar and shoot them before they shoot you! Unbelievable fast with SuperCPU. Another culty 3D-game to check out at 20 Mhz. One of the most culty C64-Games ! The screen-building-up is so fast now! The remixed version of The Last Ninja 2, with new music and new site-graphics. Grab your golf-equipment and check out this classic one, now with really FAST screen-build-up! This version by: Eagle Soft Inc.
A very cool and fast 3D-Game... But what is it about ? You crashed onto a lonely planet. Try to make the best out of it! Another kewl game by Chris Butler. Unfortunatly, the game sometimes crashes with SuperCPU. This version by: Bitstoppers, repacked to work with SuperCPU by ThunderBlade. Absorb the Sentinel! ...or get absorbed! The game beating Elite by far. Try to become the king of space! A great 3D-Spacegame. Try to find out what your mission is! The conversion of the Atari's Coin-Up. Defeat the Death Star! The culty vector-racing-game... With SuperCPU, there are a few graphics-bugs and the game is too fast. Unfortunatly Wyndex didn't come up with a proper version of his fix by now, so here is an unchanged version. This culty racinggame gets faster and much smoother with SuperCPU. Even the IRQ-Loader works with 20 MHz! Make sure to check it! BTW: In game press "V" to get the speed-display! The "pepsi-challenge-game of the year" becomes a really hard challenge with the speed of the SuperCPU! 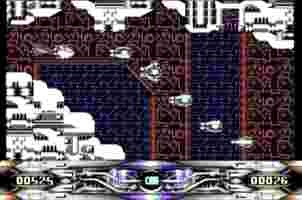 The culty gripping arcade game becomes an even harder battle with the SuperCPU, as the scrolling gets much smoother and the gravity is more realistic. Are you ready ? L = Look Down. P = Look Up. B = Fire M = Tilt Right. N = Tilt Left. CTRL/SYMBOL SHIFT = When used in conjunction with movement keys will accelerate the movement. The second part... Rebuild Sphinx! In both versions the intro music can be toggled on as in-game music by pressing F7 at any time. A cool racing-game by System 3 made by mastermind Chris Butler. Get the evil gangsters and arrest them! DISCLAIMER: All material in this section is no longer available on a commercial basis. None of the producers are still active on the C64. They are no longer interested in their old productions. By making this software download-able on this site, nobody loses any money, nor does the maintainer of this site gain any. It is all about supporting the SuperCPU.